Tejuino: Bebida sagrada | ¡VidaMaz! 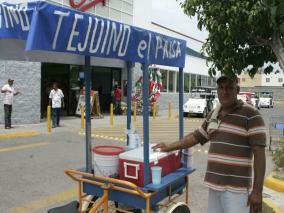 Tejuino is one of the favorite beverages sold here in Mazatlán. It is sold from push carts and in roadside stands. Supposedly it was originally made by the Tarahumara Indians. Very good, icy cold, perfect for our hot humid summers! ← Banda is not Spanish for Band!